When I try to install ESXi 5.5U3 on a DL360 G6, it fails because no storage is seen. 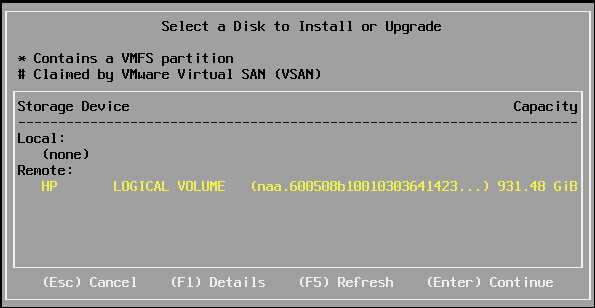 Storage config: RAID "10" on two drives, single 1TB "Logical Volume"
I've tried wiping the RAID logical volume using DBAN, just in case any prior data on there was confusing ESXi, but that changed nothing. This also shows that the storage hardware works since I was able to see the storage using DBAN just fine. The closest related question I found so far that would be similar to this was this question: ESXi 5.5 on HP ProLiant DL380 G7 Server. In that case, the admin wanted a JBOD disk pass-through, which isn't possible on the HP Proliant internal storage P410i controllers. Normally I'd try loading a special HPE storage driver, but those are supposedly included on the HPE custom images. Anyone else running ESXi 5.5U3 on a DL360 G6 see this problem and get past it? Are there logs available somehow to show what's failing on the storage detection? 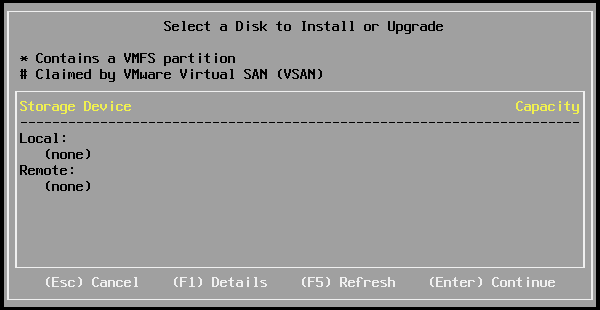 Try creating a small logical drive to install ESXi onto. I use a 16GB logical drive for this purpose. You can do this using the offline Array Configuration Utility. Create a second logical drive for the remaining capacity for your actual VM data. The non-HP VMware image worked great. What the heck? I wasn't expecting that. I'm not sure what value HP is adding to those VMware images, but for Future Me or anyone else, it's worth trying the non-HP images if things don't seem to work with the HP images. UPDATE: The HP 5.5 U2 image also works. Even though 5.5 U3 is on the compatibility list for a DL360 G6, it would appear that this release doesn't actually work properly. Not the answer you're looking for? Browse other questions tagged vmware-esxi hp-proliant vmware-esx or ask your own question. Is there a way to view an HP ProLiant server IML log from within ESXi?